Remove the engine and the transaxle assembly from the vehicle, and separate the transaxle from the engine. Refer to TM-28, "Exploded View". Secure flywheel (1) using Tool (A), and remove bolts using suitable tool. 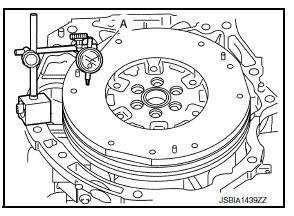 Do not place flywheel with signal plate facing down. When handling signal plate, take care not to damage or scratch. Handle signal plate, do so in a manner that prevents it from becoming magnetized. Secure flywheel (1) using Tool (A), and install bolts. Be careful not to damage or scratch the contact surface of flywheel. Measure the deflection of flywheel contact surface to torque with a dial indicator (A). Measure the deflection at 210 mm (8.27 in) diameter. Limit : 0.45 mm (0.0177 in) or less. If measured value is out of the standard, replace flywheel. If a trace of burn or discoloration is found on the surface, repair it with sandpaper. Do not disassemble double mass flywheel. Measure the movement amount of thrust (fore-and-aft) direction when 100 N (10.2 kg, 22 lb) force is added at the portion of 125 mm (4.92 in) radius from the center of flywheel. 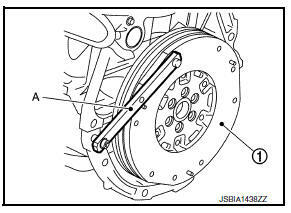 Install clutch cover bolt (1) to clutch cover hole, and place a torque wrench (A) on the extended line of the flywheel (2) center line. Tighten bolt at a force of 9.8 NВ·m (1.0 kg-m, 87 in-lb) to keep it from loosening. Put a mating mark on circumferences of the two flywheel masses without applying any load (Measurement standard points). Apply a force of 9.8 NВ·m (1.0 kg-m, 87 in-lb) in each direction, and mark the movement amount on the mass on the transaxle side. 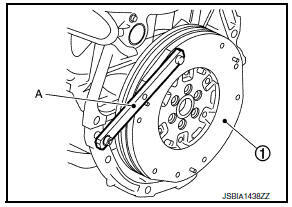 Measure the dimensions of movement amounts (A) and (B) on circumference of the flywheel on the transaxle side. Limit : 33.2 mm (1.307 in) or less.